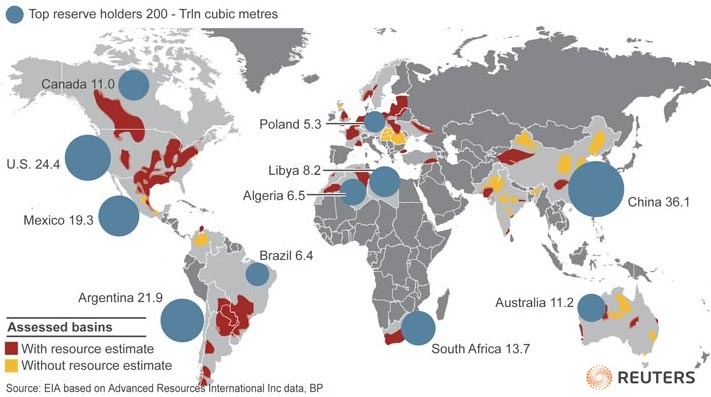 Which country might emerge as the next shale hotspot? Hydraulic fracturing (“fracking”) has represented a major boon for the US economy, producing $36 billion in 2011 and rising year over year. Understandably, other countries have been watching – and some seem determined to join in on leveraging the new technology. Poland is dancing the Polonaise for shale. Dreams of energy independence from Russia have pushed the country to issue more than a hundred exploration licenses to more than 20 firms. Looking to harness energy security and economic growth, the government set its sights on commercial shale gas production to begin in 2015. 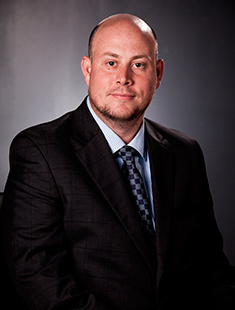 Poland’s Minister of the Environment Maciej Grabowski made shale gas his priority in 2014 – and by his calculations, as of October 2014, there were 58 concessions for shale gas, with 66 exploration wells. Much-needed regulatory reforms will speed up exploration and open the way for more western companies to drill in Poland. One such reform stipulates that foreign firms no longer must form joint ventures with a certain government-planned state-owned enterprise. Moreover, international oil majors will get a break on taxes and royalties until 2020. Poland appears to be sitting pretty atop some significant shale assets. A few of these exploratory wells have caught the attention of Western drillers. For example, Chevron Corp. has completed four Polish wells since 2012 and is partnering with state-run Polskie Górnictwo Naftowe i Gazownictwo (PGNiG, literally: Polish Petroleum and Gas Mining) to drill a well in the southeast. And last January, Dublin’s San Leon Energy Plc drew as much as 60,000 cubic feet per day in a shale formation in the Baltic Basin in northern Poland. 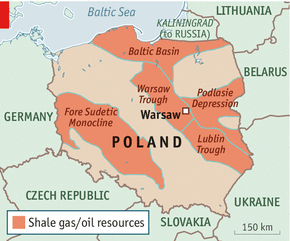 Poland is thought to house Europe’s largest deposits of shale gas. With an estimated 768 billion cubic meters of natural gas, Polish shale fields could hold enough to supply its domestic energy needs for 65 years. 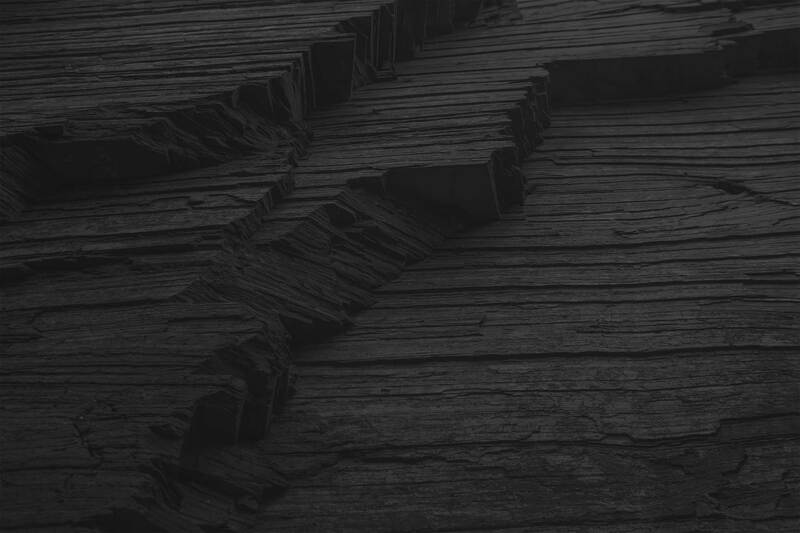 Disappointing early results are causing many investors to rethink Polish shale. Exxon Mobil, for one, gave up searching for shale gas in Poland in June 2013 after failing to find viable quantities with its two exploratory wells. Italian energy company Eni also allowed its three shale gas exploration licenses in Poland to expire, giving up further exploration barring a new “strike” where somebody else takes the risks. At this juncture, Poland’s prospects of a commercial shale gas industry remain elusive. Only 64 vertical test wells have been drilled to ascertain whether the geology can sustain a viable industry (industry recommendations call for at least 200 such test wells). These wells have so far produced only 10% to 30% of the gas flow needed to be commercially sustainable. Bottom line: “Without technological adjustments, there won’t be shale gas success in Europe,” predicts Slawomir Brodzinski, the nation’s deputy environment minister and chief geologist. Why the Mixed Emotions in Russia? One country that might have all the pieces to the shale puzzle is Russia – but that doesn’t mean they’ll be piecing it together imminently. Simply put, fracking and Russia haven’t mixed all that well as yet. Russian Premier Vladimir Putin has been particularly hostile to hydraulic fracturing in other nations, regarding it an imminent threat to Russia’s strategically vital economic interest in natural gas, almost all of which is extracted from conventional drilling. Russia’s economy is dependent upon its natural gas exports across Europe, and the growing shale supply in the US could threaten Russian hegemony. That being said, Russia is beginning to realize shale’s value. 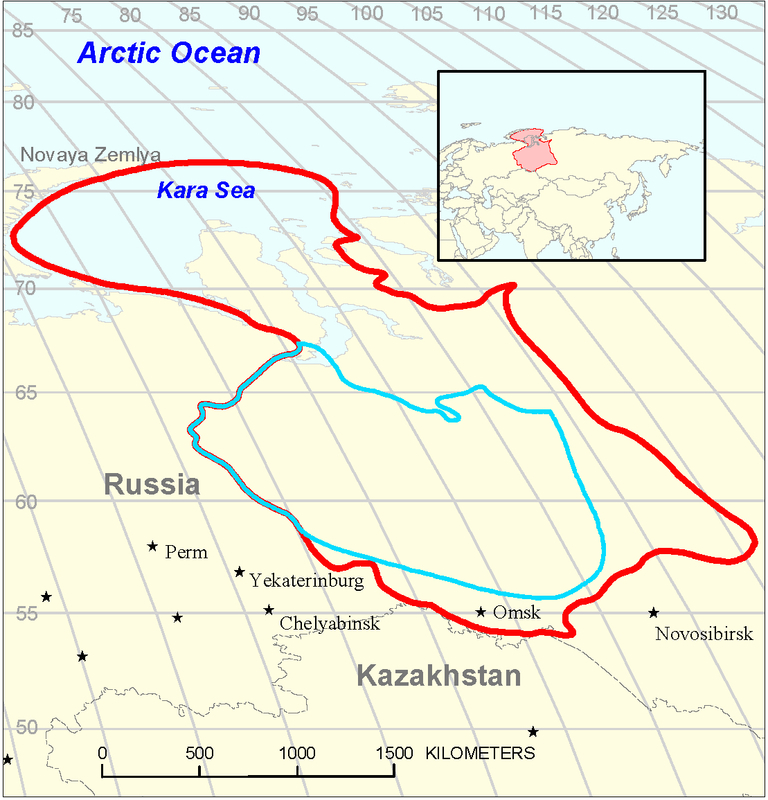 West Siberia hosts a sizable shale play. The West Siberian Basin has seen profitable conventional oil and gas production since the 1960s – and in fact still produces more than 60% of Russia’s oil. But its output peaked in the late 1980s, and declining conventional production is the impetus for E&P efforts to find new energy resources from unconventional sources. One such unconventional source is West Siberia’s 570-million-acre Bazhenov shale that extends 2.3 million square kilometers – about 80 times bigger than North Dakota’s Bakken. The play is now believed to hold one of the world’s largest deposits of shale oil along with huge amounts of natural gas. As of last summer, the US Energy Information Administration (EIA) estimates that this shale formation could hold 1,920 Tcf of natural gas, (285 Tcf of which technically recoverable) and 1,243 billion barrels of oil (75 billion barrels of which is technically recoverable). If the Bazhenov’s potential can indeed be harnessed, Russia could be looking at 10 times the amount of the Bakken. And it’s accessible: It has a sweet spot or “pay zone” 100 feet thick and does not require ice-breakers or subsea pipelines to exploit its treasures (unlike the icy, under water formations of Russia’s Arctic, another planned drilling zone). Perhaps best of all, the region is crisscrossed with mature pipeline infrastructure from the years tapping the West Siberian Basin’s conventional resources. The Bazhenov’s test wells have yielded roughly 400 barrels per day – on par with the Bakken. Some analysts believe that once exploited, the shale in that acreage will yield 1 million bpd and may contain as much as 18 billion barrels of crude. Oil and gas companies have begun targeting this source rock. Both ExxonMobil and Statoil agreed in 2012 to jointly develop tight oil technologies in Western Siberia with Russia’s Rosneft. Royal Dutch Shell plc and Russia’s OAO Gazprom Neft also began a drilling campaign in January 2014 to assess the play’s potential. But of course there’s a catch. Or two. Or three. Russia has just started drilling exploratory shale wells, and while their reserves are expected to be significant, the challenges they face are unique. For one, the arctic environment in which shale producers will have to drill is particularly harsh, and in summers the ground in Siberia softens, making it impossible to drill for large chunks of the season. For another, the Bazenhov crude may not have been “cooked” and compressed with the same geological results as American shale deposits have. To top it all off, the government itself could be standing in the way, with a current tax structure geared toward conventional reservoirs and political policies that encourage rancor and division from the West. Recent troubles in the Baltics (with Ukraine, in particular, as we discussed in a separate post) have affected joint ventures like the Royal Dutch Shell – Gazprom Neft. Last year, the Russian government instituted tax breaks for companies working in shale. But current sanctions against the country’s oil sector limit the involvement of foreign companies within Russia. Although domestic producers are continuing without their foreign partners, many recognize that Russia’s shale development will be slow-going – if not completely ground to a halt – without Western expertise and equipment. 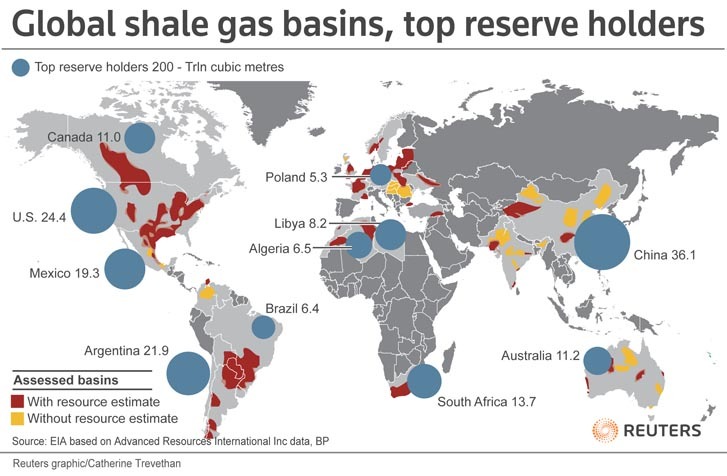 Continue reading about other potential shale developments around the world in our third and final post in this series.